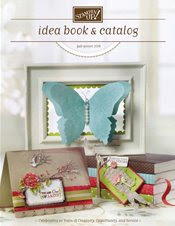 Hollybeary Creations : New Catalog!! The new Stampin' Up! Catalog is here!! Whoo Hoo!! I've been thumbing through it for days on end. There is so much cool new stuff I don't know where to start. I put in a huge order on Monday and it's due to arrive on Thursday so I will take pictures and share everything. You won't believe how gorgeous some of the new ribbons are. Just a few exciting things you will find: Vanilla Hodgepodge Hardware, 1 1/4 Inch Grosgrain Ribbon in the new pink, clips in all shapes and sizes, 12x12 Double Sided Designer paper to die for.. So stay tuned. If you haven't ordered your copy from me there is still time. The cost is $10 includes priority mail shipping and $5 off your first order*. This offer expires the end of the month. So don't delay, you will love every page!